Chicken Caesar with a Twist & Happy Birthday, Mr. Prevention! Thirty-two years ago today, the world was graced with the birth of my dear husband. Lord love’em. I love that he complains to the ends of the earth about my lack of desire and efforts to clean. Yet he doesn’t care enough to really help out, only enough to participate in “damage control” (i.e. not making epic disasters for no reason). So we finally hired a cleaning lady and it may be what saves our marriage (I’m only half kidding). And let’s not talk about the most absurd reasons for never unloading the dishwasher. My personal favorite is, “I don’t use that many dishes.” I cook (and clean-up) and you eat. Who gets the short end of this stick again? Lord love’em he’s the HARDEST person to buy for. I had actually tried to plan a surprise trip to Mexico going through the trouble of even emailing his assistant to find out his meeting and travel schedule, only to have him tell me “he’s really sick of traveling.” There went that idea. Not a clue. He’s a simple, simple man I tell ya. I harassed him all weekend, “What do you want me to make for your birthday? Faux fried chicken? Buffalo Chicken Lasagna? Fried pickles? Cupcakes? Cookies? Cake? My DEAR, I asked you this over the weekend for a reason. You gave me about 15 hours of notice, 6 of which were at work, 2 of which were spent driving to/from work and hockey, 1 was playing hockey, and 7 were sleeping. Oh wait, that’s 16 hours. You get my drift. At least the birthday boy got to eat what *I* wanted last night — these salads. Of all the favorite cafe selections at the hospital, everyone looks forward to Caesar Salad with a Twist most. It is quite the hot commodity and there’s no surprise as to why. So, I just had to share it sooner rather than later. Enjoy! 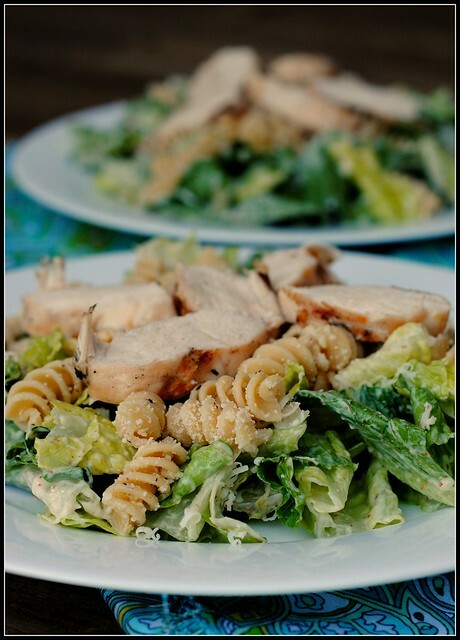 Chicken Caesar with a Twist! Meanwhile, start a small pot of boiling water. Add pasta and cook 9-12 minutes, until al dente. Add chicken to preheated grill and grill 4-5 minutes per side. Remove to a cutting board and cut the breasts width-wise into thin pieces. While chicken cooks, combine all of the dressing ingredients and set aside. When the pasta is cooked; drain and return to the pot. Toss with olive oil, salt, Italian seasoning, and grated Parmesan. Toss the lettuce with the dressing and shredded Parmesan. 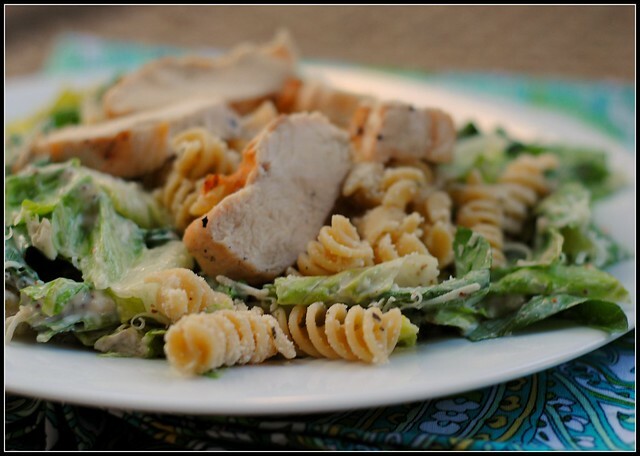 Divide salad among 4 plates and top with 1/4 of the pasta and 1/4 of the chicken. Serve immediately. 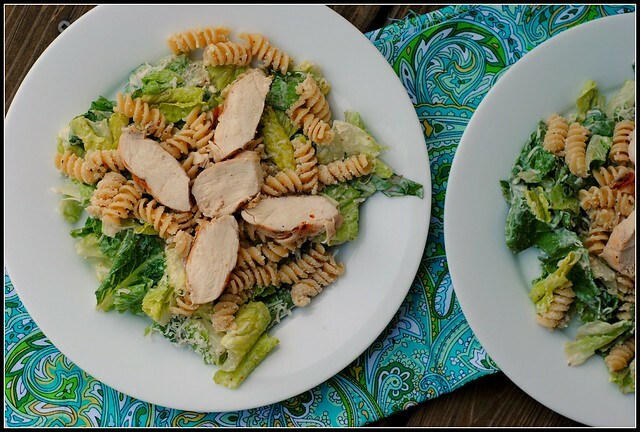 Yield: 4 salads with ~1/2 cup pasta and 3 ounces chicken. Result: Mmmm! There’s a reason this is a favorite among so many — it’s comfort and healthy in one! Plus, it’s ready in no time and is a perfect way to use up leftover pasta or chicken. You could easily make this with shrimp, too! 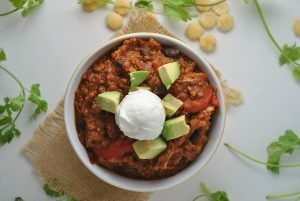 Loved everything about this meal and with all the fiber and protein, it’s a very filling meal for under 400 calories! See you Thursday for a Q&A! Happy Happy Birthday Mr P! My Mr does the same thing with the dishes. We made a deal when we got married that I would cook and he would do dishes. He will occasionally flip flop them without me asking but since I’ve worked from home, it seems our original deal has gone by the wayside and I don’t remember renegotiating! I love pasta in salad! Makes it go a little longer in terms of satisfaction. And happy birthday to the hubs! I hope it’s a good one! 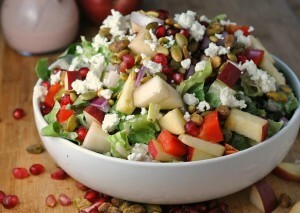 This salad looks great……..I love quick, easy and tasty! And Nicole, if you ever want to take ME on a surprise trip to Mexico, I’m NEVER sick of travelling! Ever. LOL. Happy Birthday Mr. Prevention! Those salads look AWESOME! I love me a caesar salad…with a twist! Have a great day! Happy birthday to Mr. P! Hooray for getting a housekeeper! Seriously, I think in 13 years my husband has cleaned the bathroom once, and emptied the dishwasher once, and hasn’t done laundry since our first year of marriage – wtf?! Now I want one! Enjoy the celebration, whatever you decide to do! I love the look of these salads. Caesar salad is one of my favs!! Nicole, we can’t live with them and you can’t live without them 🙂 Enjoy your day! Love this idea for a meal. Simple and delicious! This post was hilarious, Nicole, lol! Happy Birthday, Mr. P! 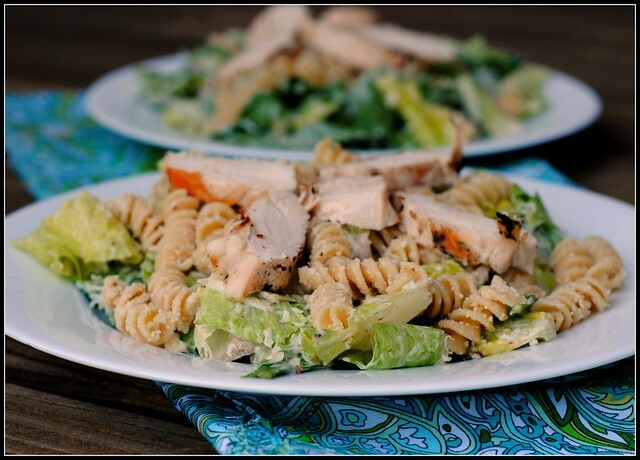 What a delicious meal, and pasta on salad — how ingenious! Happy birthday, Mr. P! And I’ve printed this out–looks delicious! I kind of feel him – I hate emptying the dishwasher too! Love the salad – looks awesome!! Happy birthday, Mr. Prevention! This rocked! Thanks for this awesome recipe. Love your blog!